Christus, der ist mein Leben (Christ, he is my life), BWV 95, is a church cantata by Johann Sebastian Bach. He composed it in Leipzig for the 16th Sunday after Trinity and first performed it on 12 September 1723. Bach wrote the cantata in his first year Bach in Leipzig for the 16th Sunday after Trinity and first performed it on 12 September 1723. The prescribed readings for the Sunday were from the Epistle to the Ephesians, praying for the strengthening of faith in the congregation of Ephesus (Ephesians 3:13–21), and from the Gospel of Luke, the raising from the dead of the Young man from Nain (Luke 7:11–17). In Bach's time the story pointed immediately at the resurrection of the dead, expressed as a desire to die soon. 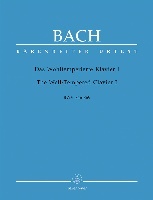 As Salomon Franck expressed in his text for cantata Komm, du süße Todesstunde, BWV 161, composed in Weimar in 1715, the unknown poet concentrates on a desire to die, in hope to be raised like the young man from Nain. The poet includes four stanzas from four different chorales. Two stanzas from chorales are already presented in the first movement, "Christus, der ist mein Leben" (Jena 1609) and Martin Luther's "Mit Fried und Freud ich fahr dahin" (1524), a paraphrase of the canticle Nunc dimittis. Movement 3 is Valerius Herberger's "Valet will ich dir geben", and the closing chorale is the fourth stanza of Nikolaus Herman's "Wenn mein Stündlein vorhanden ist". A week before, Bach had included three stanzas from a chorale in Warum betrübst du dich, mein Herz, BWV 138. In this cantata he includes four stanzas from four different funeral hymns. The first three movements combine three of them, first stanzas throughout. 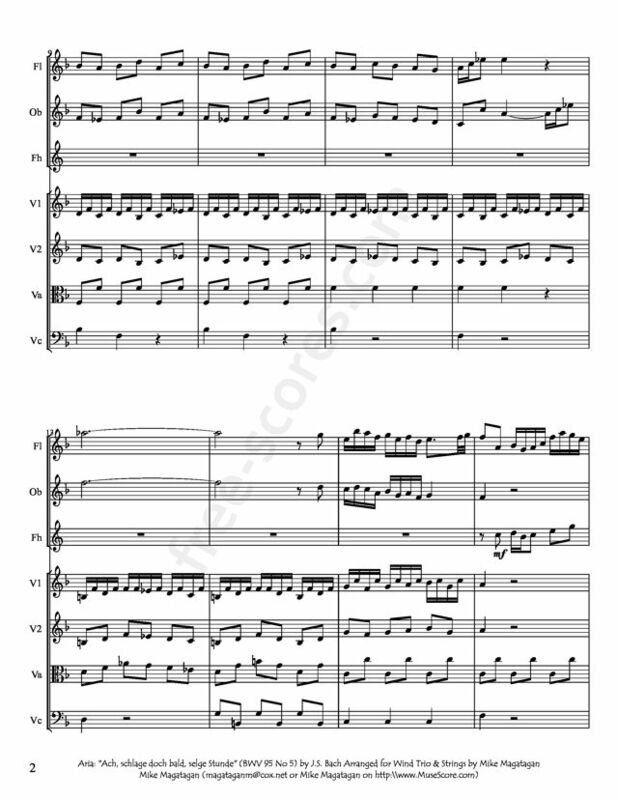 The first chorale on a melody by Melchior Vulpius is embedded in a concerto of oboes and strings in syncopated motifs in parallels of thirds and sixths. 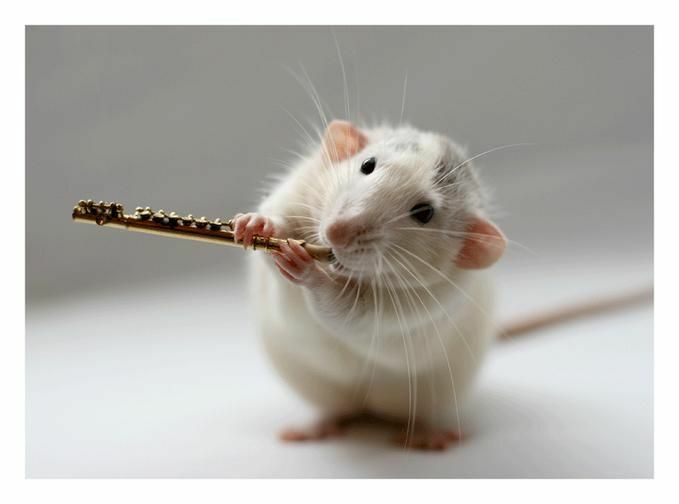 The melody in the soprano is enforced by the horn. The line "Sterben ist mein Gewinn" (Death is my reward) is slower than the others, in a tradition observed already by Johann Hermann Schein. The recitative alternates between secco and accompagnato, with the same accompanying motifs as in the chorale. The second chorale on Luther's melody is graced by an independent violin part, and every line is preceded by an entry of the horn. 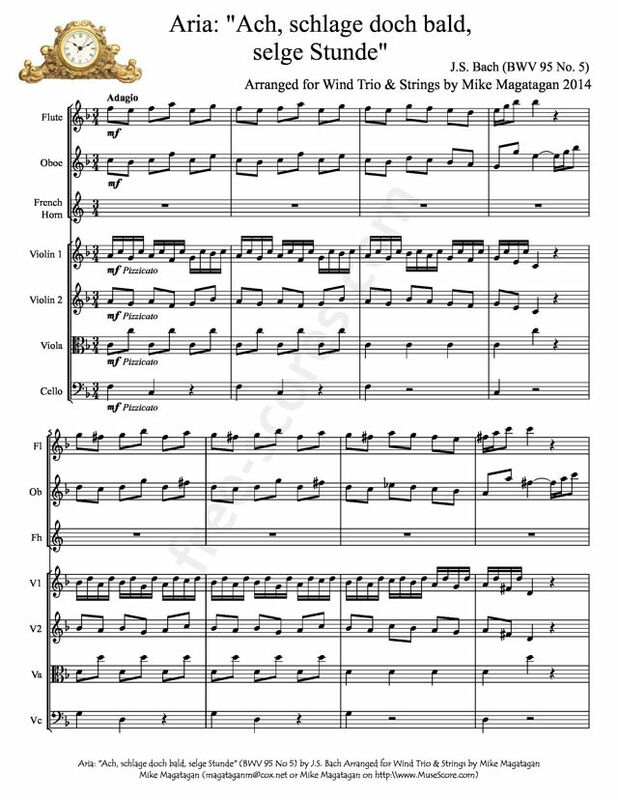 A secco recitative leads to the third chorale, which is sung by the soprano alone like an aria, accompanied for the first line only by the continuo, but for the rest of the text by the oboes, playing an obbligato melody in unison. The only aria of the cantata is dominated by the oboes and accompanied by pizzicato in the strings which symbolizes funerary bells. The closing chorale is again enriched by a soaring additional violin part. 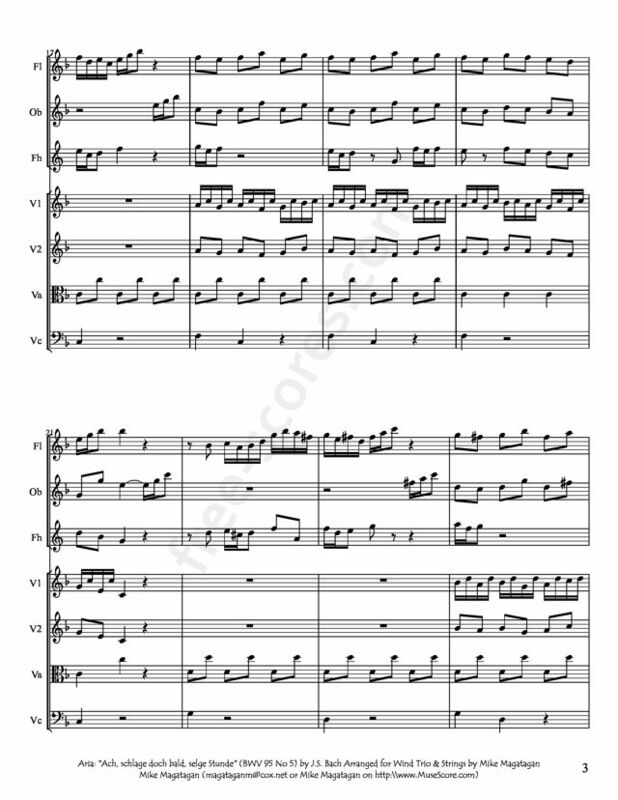 Although originally scored for three vocal soloists (soprano, tenor and bass), a four-part choir, horn, two oboe d'amore, two violins, viola, violoncello piccolo and basso continuo, I created this arrangement for Wind Trio (Flute, Oboe & French Horn) & Strings (2 Violins, Viola & Cello).